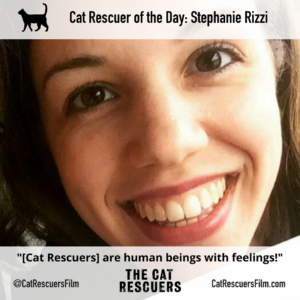 3/30 Cat Rescuer of the Day: Stephanie Rizzi! The Cat Rescuers is an upcoming documentary about four dedicated volunteers who are saving the lives of hundreds of abandoned and feral cats on the streets of Brooklyn. Our film calls attention to a global issue being addressed by thousands of organizers and heroic human beings – those who do TNR, volunteer at shelters, take on fosters, what have you. Since we could only put a fraction of those wonderful people in our film, we’ve created the Cat Rescuer of the Day program to celebrate the efforts of as many as possible. 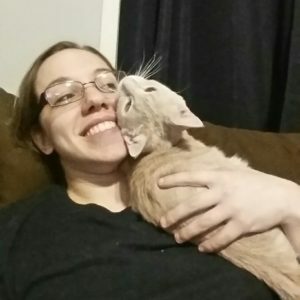 Meet Today’s Rescuer: Stephanie Rizzi of Queensbury, NY, founder of F.A.C.T. Animal Rescue! Seven years ago, I started F.A.C.T. when I was 23 years old and it has grown into a successful nonprofit. I have saved and helped saved well over 500 cats over the years through fostering, spaying and neutering, and raising awareness. I am currently starting a spay/neuter program in my area due to the high volume of homeless cats. I hope to link an educational program with this to help decrease cat abandonment as well. That’s the nutshell version! Just one?! Clark came from a sad situation up north a bit. He and several other cats and kittens were dumped at a woman’s trailer over the years. Most were sick, some were even dead, sadly. I remember driving to the place and being cautious, knowing that there were cats everywhere from what the woman said. All the big shelters told this woman they couldn’t help her. I went there with a girl from a small Vermont rescue, and we caught as many as we could with our bare hands. I left there dirty and sweaty from being in 90 degree weather in the dirt. Clark was so sick that he could barely open his eyes. I picked him up and saw his leg was twisted. Upon bringing him to the vet, they found BB gun shrapnel in his legs. It was a long recovery for him, but he found an amazing forever home. That we are human beings with feelings. We try and try to take in every cat, but sometimes there is no more room and it breaks our hearts. To be given such a hard time from people is hard enough, people who don’t understand that we are volunteers who have jobs and a family… but to reach a point where we have to refer them elsewhere hurts even worse. We get calls during family time, during work hours, during meals, when we are sleeping, and we are often unappreciated. Music – listening to it, playing it. It’s an escape from the harsh reality and the sad things I have to see nearly every day. I hope it can shed some light on what it’s really like to do rescue so that the general public have more respect and understanding for those who do it. Go follow Stephanie on Instagram (@ChangeRightMeow). And be sure to follow @CatRescuersFilm on Facebook, Twitter and Instagram! Click here to browse more Cat Rescuer of the Day posts. Want to be Cat Rescuer of the Day? Click here to submit your answers today and we’ll feature you in an upcoming post.